Finding a distinctive identity as a city can be a challenge. Ashland has always been resistant to following the expected path. Through luck, serendipity, and hard work, the city managed a transformation from lumber and woolen mills, and possible obscurity, to the lovely vibrant city it is today. The location in a picturesque river valley surrounded by mountains helped, and it didn’t hurt having the highway and railroad eventually run through town either. Still, to become the cultural hub Ashland is today took a myriad of visions from citizen leaders. One good idea cultivated another. Some of those ideas survived, others didn’t. Ashlanders ended up maximizing the potential of this small town. A big part of the dream included the arts. Ashland’s first public art pieces are the result of citizen philanthropists who recognized the power of public art. Leaving something behind for others to experience had the result of placing them in the historic context of Ashland. This benevolence resulted in the plaza’s Pioneer Mike, the Butler-Perozzi Fountain in Lithia Park, and the ethereal stone woman fronting the library. Public art creates an immediate sense of place in the landscape of the city. While most of the city’s art pieces have been funded privately, citizens realized public art also deserves public support. 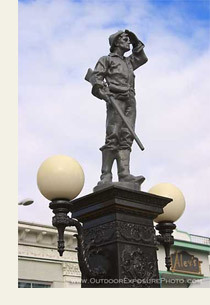 In 2002, the city formed a Public Art Commission as an advisory board to the City Council. Art funding comes from a percentage of the transient occupancy tax. As well, to enhance public spaces, a percentage from the city’s larger capital improvement projects are reserved for art. 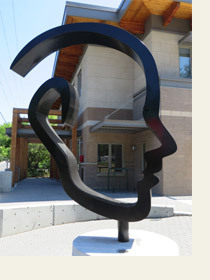 Recent publicly funded additions to the art scene include the sculpture “Open Minded”, by CJ Rench, at Fire Station #2. Look closely as the profile subtly depicts both male and female entities. 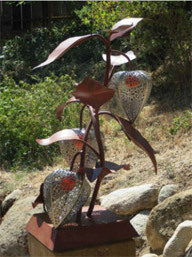 The sculpture “Fall Splendor”, by Annette Julien now greets pedestrians at the top of the Calle Guanajuato Stairway, and is a long awaited addition to the Arnie Kriegel Sculpture Garden. 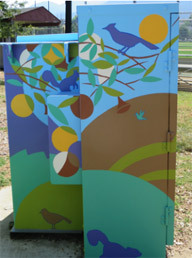 North Mountain Park has a symphony of color and images painted by Ann Di Salvo on utility boxes. The gateways to downtown are prime locations for public art serving as welcoming and memorable images of Ashland. The sculpture “We Are Here” by Russell Beebe is located on the north side of downtown. An homage to the first people living here, this was generously paid for by a private citizen. Public art gives eloquent testimony to the past by talking to the present and future generations. The Public Art Master Plan identifies the south downtown gateway for a major art piece. Public art funds have been set aside for the triangular site situated between the Library and the Fire Station. Through a Request for Qualifications process, over 60 artist applications were reviewed. Based on experience, knowledge, and artistic sensibility, the field was first narrowed to thirty, ten, then four of the most suitable and qualified artists. Last fall finalists visited the city, reviewed public input, and had the opportunity to experience this special place called Ashland before creating artistic concepts. What can the city expect for the Gateway Island? Be ready for a monumental, visually memorable art piece connecting our community through creative place making. This contemporary sculpture will be art of our time, demonstrating Ashland’s sense of pride and continued commitment to public art.